What’s the Difference Between a Barber and a Cosmetologist? The barber has one of the most ancient professional occupations still around to this day. Still, there is a bit of confusion about the differences between a barber and a cosmetologist. The word barber stems from the Latin word, barba, which means “beard.” The art of barbering took off when it was introduced to Rome by the Greeks. There, it quickly became a place for men to gather. It was even an important area in a young man’s life, because the first shave was considered to be a critical moment in his growing up. Barbers are trained specifically for the men’s hair and facial hair. They are trained to work with clippers and shears. Together, clippers and shears give tapered haircuts from very short to medium length cuts. A tapered cut is from a shorter length at the base to a longer length on top. 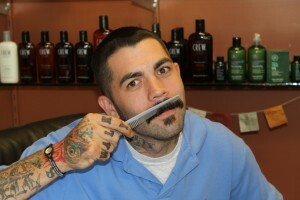 Barbers are also trained to work with straight razors. Straight razors are used to shave faces, necks, and scalps. The straight razors are also used in some haircut techniques used by barbers. At Dave’s Barber in Woodstock, Georgia, we use the straight razor for various reasons. Only barbers are trained and licensed to perform straight razor shaves in Georgia and most other states. Just as it was in Rome, the barber shop experience is much different from your pop up hair salons around town. If you are a guy, barbers have been trained especially for you. They know how to shape your hair, your facial hair, and treat any other grooming needs. Most barbers use products that are specifically made for men’s hair and scalp. Are you still wondering why every guy should go to a barber shop for their haircut? Stop by Dave’s or set an appointment and find out why. We’re sure that the shampoo and neck shave with every haircut will be just part of the reason why you will come back.